The following is a detailed list of scooters or scooter parts stolen from owners in the UK. This information is provided by the owner in the hope that scooterists at large can help them recover their property by being vigilant and notifying them (or myself) should you become aware of stolen property that appears in the "LCGB National Stolen Scooter Registry". 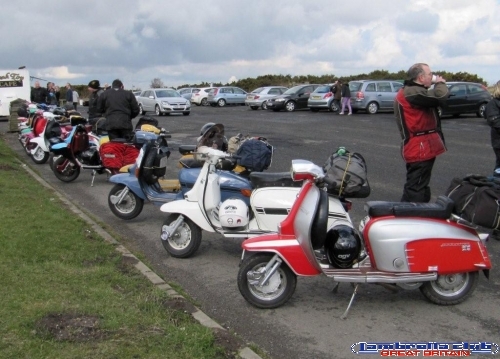 The NSSR will only accept reports for missing Lambretta or Vespa Geared scooters or Lambretta and Vespa Auto Scooters. In the online Registry, we will NOT publish the chassis or engine numbers in full (at your request). I urge you to contact me should you have any STRONG suspicion regarding any purchase, particularly on sites such as Ebay to check any potential purchase does not appear on the LCGB National Stolen Scooter Registry. All information received is treated in the strictest confidence. chucked into the back of a white transit on Beck St Nottingham NG1 1EQ. your scooter. Green flashes. Lights do not work on front. fitted with vent hole on panel. silver logo that says "too darn soulful". hammer zombie copy pipe. termongi sticker on it, it's like one of a kind the pipe. Other Details/Notes:: Important or unique details that might help identify your scooter. chromeparts/3 in 1 carrier with target backrest,pillion footrest,rear chrash bars,handlebar grips,flywheel cover,gearbox cover,tax disc holder.black metallic wheels/whitewall swalbe weatherman tyres.small faces sticker on glovebox.vespa mudflap,simonini exhaust,cracked speedo glass,dented left hand side panel. Pair of painted n.o.s Tv1 side panels c/w n.o.s scripts and handles. Concours condition and perfect in every way. Area Stolen From: Portsmouth, Hampshire. 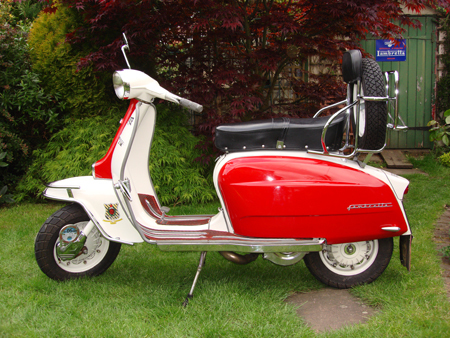 Other Details/Notes: I just wanted to log my 205 CC Lambretta engine that was stolen from my shed in willingham in 1991. Removed from a TV200 frame which was registered in my name. Any information or maybe someone was with this person at the time. Other Details/Notes: Important or unique details that might help identify your scooter. The scooter was under restoration stolen from garage without side panels. 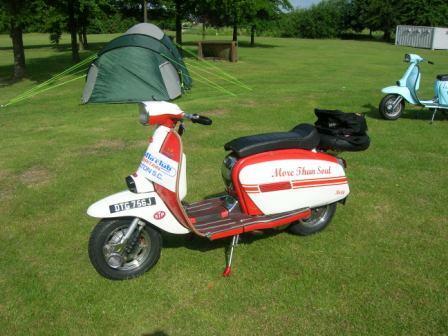 Area Stolen From: Pontins, Camber Sands, W. Sussex. also bridge piece is engraved with daddys girl !! Yamaha Master cylinder cover in polished alloy with innocenti logo. electronic model brackets welded in frame. Original fuel filler area cut out to take aero type cap, this has been removed and alloy surround fitted which looks really bad from underneath. Engine powdercoated black. By filling in the following form, I will make every attempt to place your stolen property on the LCGB National Stolen Scooter Registry as swiftly as possible. Why register your stolen property? It is vital that missing scooters or parts are added to this site. The LCGB will publish these pages as well as linking them on our web site and forums. Through wide publicity, we hope that scooterists will be aware of missing property and be vigilant. The more people who know about your missing property, the better. The chances of it being spotted increase and the opportunity for thieves to pass on your property diminish. Please check back regularly for updates to the Register and PLEASE circulate this web page to as many people as possible. Link it on your facebook page, twitter, myspace, youtube account and so forth. The more people know about this, the better. All details or accuracy of details of Scooters or Scooter Parts submitted to the LCGB National Stolen Scooter Registry and appearing on the National LCGB Stolen Scooter Registry are the sole responsibility of the submitter. The LCGB it's committee, staff or others otherwise associated with the LCGB bear no responsibility for the accuracy of details submitted to the LCGB National Stolen Scooter Registry.